This Miller Spectrum® 875 plasma cutter with 50 ft. machine torch is designed specifically for automated plasma cutting with a CNC interface. CNC/Automation package comes complete with everything you need to hook the 875 up to your computerized cutting table. Plasma torch fist easily into your 180 degree straight torch holder. 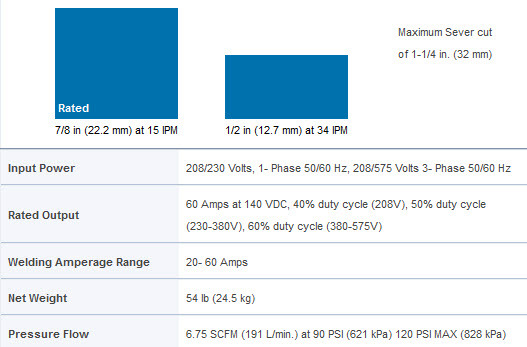 The Spectrum® 875 Auto-Line feature allows this plasma unit to automatically connect to any primary input voltage from 208 - 575 volts single- or three-phase, 50 or 60 Hz. Auto-Line unit automatically connects to any primary input voltage from 208 to 575 volts single- or three-phase, 50 or 60 Hz. LVC line voltage compensation provides peak performance power under variable input voltage conditions (+/-15%) for steady and cleaner ending cuts. 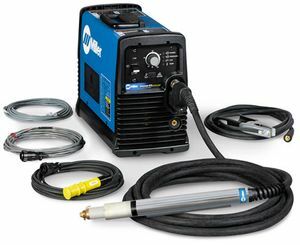 Ultra-Quick Connect™ 50 ft. XT60M torch for automated/mechanized plasma applications. CNC/Robotic machine interface is standard and comes complete with all cables and connectors. Can be powered by any Miller engine drive with generator power at or above 10 kW (e.g. Bobcat 250) or equivalent competitive equipment. See page 3 for engine drive compatibility and recommended settings. Starts without high-frequency so it will not interfere with or damage controls or computers. Automatic Air Regulation - For end user convenience, the unit has no pressure gauge or manual regulator knob. The unit automatically adjusts the air pressure to the torch for optimum cutting and gouging. No adjustments necessary. Internal Remote Harness for remote start and ok-to-move signal. CNC Signal Cable for arc initiation and cutting sequence. Voltage Sensing Signal Wire Assembly for torch height control. Remote Pendant Control for remote manual momentary on/off.